Have you found yourself craving an all-inclusive vacation? When beaches, turquoise waters and warm temperatures beckon, consider booking a trip to an all-inclusive resort in the Caribbean. With destinations that range from Cancun to Jamaica and even Aruba, a trip to an all-inclusive Caribbean resort will give you the chance to experience the quintessential tropical vacation. The tropical islands in the Caribbean are famous for their all-inclusive resorts. This accommodation option makes travel easy since your lodging, meals, drinks, and even some activities are usually included for one price. However, when it comes to traveling to the Caribbean, some properties offer more value than others. Here are a few of the best all-inclusive resorts in the Caribbean. From the moment you arrive to the Le Blanc Spa in Cancun, you’ll be pampered. At the Le Blanc, the spa’s staff will greet you with chilled towels and coconut milk. A butler will even unpack your bags for you. Spending time at the pool involves attendants who will bring you icy cold bottled water, cucumbers for your eyes and towels. The adults-only Le Blanc Spa has a minimal, all-white design, one that is stylish and soothing. Curved lines add a softness to the resort while the marble floors enhance its lush appearance. The food is delectable with cuisine choices ranging from multi-course French food to handmade Italian pastas. At the resort, there are 19 Le Blanc d’Or treatment rooms that are surrounded by a bamboo garden, so you’ll have plenty of chances to relax as the resort’s skilled staff treats your body and soul. Extras like coconut cocktails and aromatherapy pillows add even more value to this accommodation option. The Le Blanc Spa overlooks one of the destination’s most amazing beaches, and you can fly to Cancun directly from major U.S. air hubs like Atlanta, Boston and Chicago. Rates are around $500 per night, but the resort’s quality accommodations, food and location make it worth every penny. A family-friendly atmosphere and an amazing location on the beautiful Grace Bay Beach make the Beaches Resort Villages and Spa one of the best all-inclusive resorts in Turks and Caicos. The resort’s water park, 10 pools and abundance of kid-based activities are sure to keep you and your family busy. As a resort guest, you’ll have the opportunity to dine at 20 different restaurants, relax by six pools and drink cocktails at 12 bars. The resort spans more than 65 acres. Because of this, you can only reach a few off-site attractions on foot. However, with a massive spa and access to land and water sports, you may not want to leave Beaches. The resort provides snorkeling equipment, kayaks and windsurfing gear in addition to volleyball courts, billiards tables and outdoor chess. Direct U.S. flights from Miami, Atlanta, Boston and New York are available. Winter pricing will run you around $900 a night, but the resort’s no-tipping policy, dining options and included activities make it a good value. The Tamarijn Aruba all-inclusive resort was built in 1975, and it is located along Druif Beach, allowing guests to stay in an amazing location. Every room is oceanfront, so you’ll have a stunning view during your stay here. This family-friendly resort features a 30-foot climbing wall, which is situated on the beach, tennis courts and four outdoor pools. Colorful lighting and sharp design lines give the resort an art deco feel, making it stylish and fresh. While staying at the Tamarijn resort, you’ll be near sites like Eagle Beach and the California Lighthouse. However, the resort’s highlight is its location on Druif Beach. This expansive, oval-shaped stretch of pure white sand is clean and safe. It also faces west, ensuring that you’ll return home with plenty of stunning sunset pictures. As a guest of the Tamarijn, you’ll have access to the towel hut on the beach. There’s also a tent where you can borrow snorkeling equipment, sail boats and kayaks. Food and drinks at the resort are unlimited, and since you can choose to dine at 10 different eateries and drink at eight bars, you’ll have plenty of options. You can fly directly to Aruba from major U.S. cities like Miami, Boston and New York. With nightly rates at around $450, this property offers plenty of value. While the Zoetry Agua seems like an adult-only property, the resort welcomes people of all ages, but because the Zoetry doesn’t provide discounted prices for kids and doesn’t have child-friendly amenities like a dedicated pool or a kid’s club, guests tend to leave their offspring at home when they make reservations at the all-inclusive resort. This makes the resort very popular with couples who prefer a quiet vacation. Lush grounds, immaculate pools and modern common spaces deliver a tranquil travel experience. The Zoetry Agua has a private beach, increasing the exclusivity of the resort, and since it’s located in a rural section of Punta Cana, this is the place to go when you need a break from the noise and chaos of your everyday life. Four high-end restaurants will keep you well fed. There are also bars next to the resort’s pool, on the beach and in the lobby. Rooms are luxuriously appointed with upscale beach décor, dark wood furniture and bamboo accents. Deep stone soaking tubs add a spa feel to the bathrooms in the guestrooms as do rainfall showerheads and plush robes. Every room comes with a fully stocked mini bar, and housekeeping will freshen up your space three times a day. At this resort, you’ll pay around $450 a night, and U.S. cities like New York, Philadelphia and Chicago offer direct flights to Punta Cana. 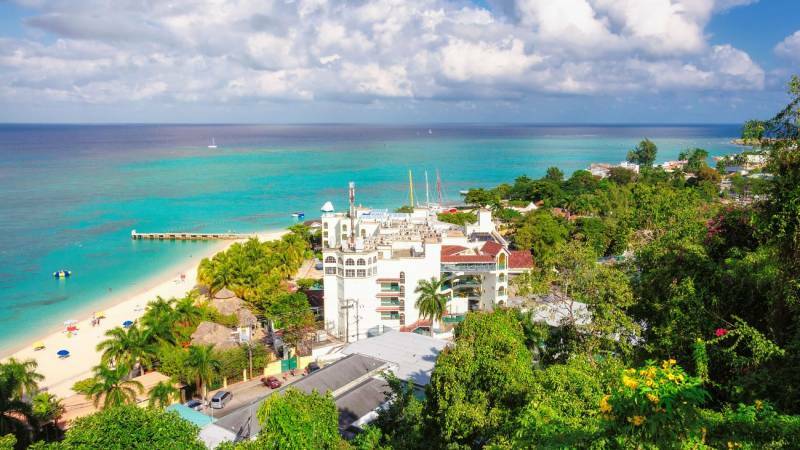 Popular with couples and young families, the Round Hill Hotel & Villas in Montego Bay is one of the area’s best all-inclusive resorts. Surrounded by meticulously maintained greenery and located in a quiet section of Jamaica, the resort feels like a secluded tropical escape complete with a nightly cricket and frog chorus that is sure to lull you to sleep. Sweet smelling air welcomes you to the resort as does an attentive staff. Ralph Lauren designed the guestrooms at Round Hill, so you’ll enjoy understated elegance during your stay. White linens create a perfect contrast against the dark wood four poster bed while a desk and plush white chairs put the finishing touch on the space’s design. Royal blue throw pillows combined with pineapple-embroidered blankets give the resort’s guestrooms a touch of whimsy. The Round Hill resort welcomes kids, and it does so by offering you access to a nanny service. It also has a kid’s club and menu items that will appeal to young diners in its restaurants. A spa with yoga trainers is available at the resort. You’ll also have the chance to swim in the Round Hill’s infinity pool. When it comes to direct flights to Montego Bay, major airports in Washington D.C., Chicago and New York offer them. Pricing for this all-inclusive resort is around $350 a night.